We're taking a look at all the best deck options for the Standard Brawliseum Tavern Brawl during the Rise of Shadows expansion! Our Hearthstone Standard Brawliseum Decks post will feature all of the best options for this Tavern Brawl in the early stages of Rise of Shadows! We'll be featuring some of the top deck lists we know of early in the expansion, and eventually featuring some 12-win decks that come up throughout the days ahead. This is a bit of surprise, because Blizzard tends to wait longer before they go and throw a Brawliseum at you. However, I think it's pretty cool because it gives deck builders a chance to take their potentially unknown brews and beat up the competition. 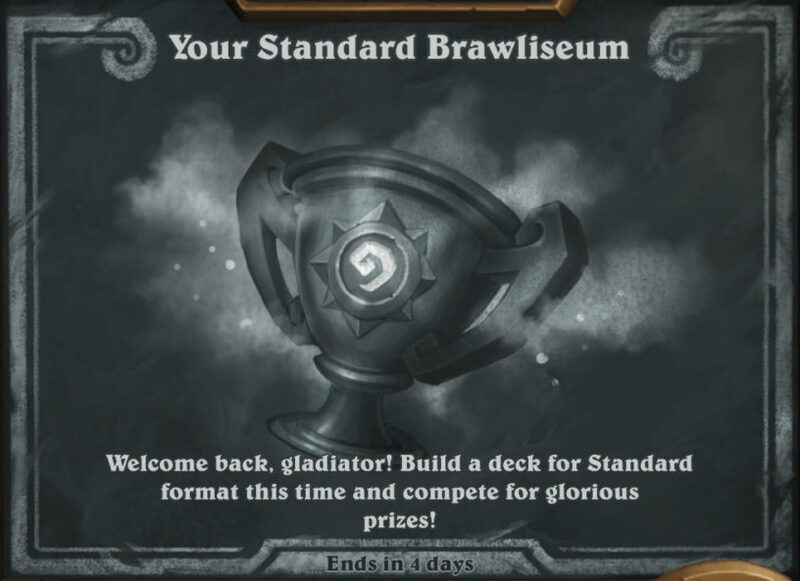 This is going to be a pretty fresh feeling meta that starts forming in Brawliseum, so take advantage while you can! While you will have to pay for runs, your first one is free! You might as well give it a shot even if you aren't that interested. Here's a look at the rewards you will get if you get a certain amount of wins. They are basically the exact same rewards as in Arena. Credit to AintEverLucky on Reddit. 8 wins: a ROS card pack, and 150-160 gold, PLUS one random reward from this list [35-50 gold, or a golden common card, or a golden rare card, or an epic card, or a legendary card] AND ALSO one random reward from this other list [20-25 gold, or 10-25 dust, or a rare card]. 9 wins: a ROS card pack, and 150-165 gold, PLUS one random reward from this list [85-125 gold, or a golden common card, or a golden rare card, or an epic card, or a legendary card] AND ALSO one random reward from this other list [20-25 gold, or 10-25 dust, or a rare card]. 10 wins: a ROS card pack, and 170-180 gold, PLUS one random reward from this list [85-125 gold, or a golden common card, or a golden rare card, or an epic card, or a legendary card] AND ALSO one random reward from this other list [65-95 gold, or 65-95 dust, or a rare card]. 11 wins: a ROS card pack, and 195-205 gold, PLUS one random reward from this list [140-180 gold, or a golden common card, or a golden rare card, or an epic card, or a legendary card] AND ALSO one random reward from this other list [65-95 gold, or 65-95 dust, or a rare card]. 12 wins: a ROS card pack, plus 215-225 gold, and another 25-35 gold, PLUS one random reward from this list [140-180 gold, or a golden common card, or a golden rare card, or an epic card, or a legendary card] AND ALSO one random reward from this other list [70-100 gold, or a second card pack from any Standard set, or a golden rare card, or a golden epic card, or a golden legendary card]. It's very early on in this Brawls life, so we're going to just feature some of the decks that have been doing well on the ladder so far. We will be adding some high win options as soon as those start rolling in! These decks were shared by HSReplay's Twitter account and have high winrates in the Brawliseum!